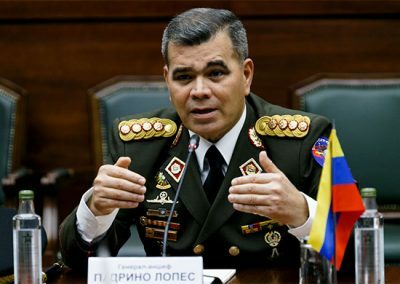 Defense Minister Vladimir Padrino Lopez said the armed forces won't recognize Juan Guaido, an imposed interim president. Venezuela’s Defense Minister, Vladimir Padrino Lopez, declared Wednesday that the National Bolivarian Armed Forces (FANB) refuses to accept the opposition leader Juan Guaido as the interim president of the Latin American country. “The Homeland’s soldiers don’t accept a president imposed by obscure interests or self-proclaimed unlawfully,” said Padrino Lopez in his Twitter account, adding that the armed forces will defend the Venezuelan constitution and national sovereignty. Last Monday a group of soldiers, arrested and facing trial, moved in two military vehicles, stormed the headquarters of the Detachment of Urban Security located in Petare, Sucre municipality, stealing from there a batch of weapons and kidnapping two officers and two members of the Venezuelan National Guard at gunpoint. The government of Mexico, led by the center-left Andres Manuel Lopez Obrador, maintained its previous position and reaffirmed their recognition of Nicolas Maduro as the legitimate president of Venezuela. Bolivia, Uruguay and Russia also decided to recognize Maduro. The Venezuelan president described the international effort as a coup organized by Washington against the Bolivarian Revolution and announced the Latin American country would end diplomatic relations with the U.S.
Opposition forces backed by the U.S. and other right-wing governments and organizations i the region continue with their coup agenda against the Bolivarian government. Meanwhile, in the streets of Caracas, Chavismo mobilizes in defense of peace, democracy and sovereignty of the country in the face of interference and destabilization of the national and international right-wing .